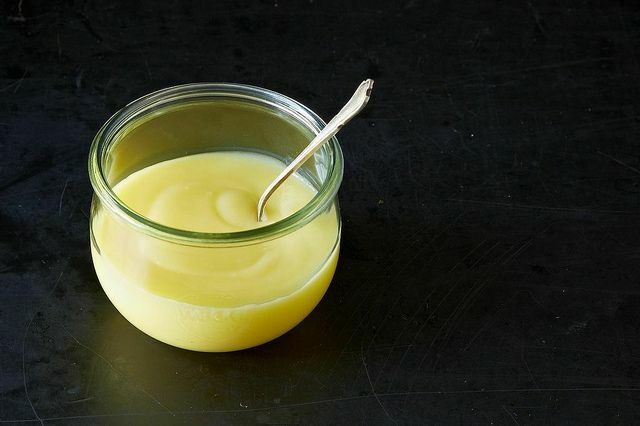 Today: Lemon curd may sound and taste fancy, but you can whip it up in less than 10 minutes -- without a double boiler, and without separating a single egg. Lemon curd takes less than 10 minutes to make -- and you don't even need to separate eggs for it, if you don't want to. You can make curd with 3 whole eggs instead of 5 or 6 yolks -- it actually tastes brighter and better than way -- or meet halfway and use 1 whole egg and 3 yolks. There is no need for a double boiler and no need to temper the eggs: the sugar and the acid from the lemon juice prevents them from curdling (and straining removes the few inevitable bits of cooked egg). Just do this: Put a medium mesh strainer over a clean bowl near the stove. Put all of the ingredients from your favorite recipe (or mine, below) into a heavy non-reactive saucepan, adding the butter last, and whisk briskly over medium heat. After the butter melts, the mixture will thicken and start bubble at the edges; continue to cook and whisk (sweeping the sides and corners of the pot) for another 15 to 20 seconds. Strain into the clean bowl, pressing gently on any solids. Let cool and refrigerate. 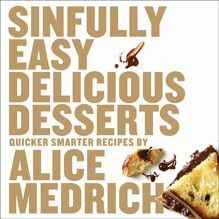 Alice's most recent book, Sinfully Easy Delicious Desserts, doles out delicious dessert recipes that don't take hours of prep (a lot of them don't even require turning on the oven) -- everything from lattice-free linzer to one-bowl French chocolate torte. could you do this with limes as well? Hooray, I seldom bake anymore because of the sugar but have spent too much energy drooling over images of other people Yule Logs and watching The new British Baking Show because I Love Sue Perkins, that I have decided to honor my birthday this year with a proper cake, rather than desert with dinner out. So I sat down to look for specific inspirations and your Genius of 2014 collection hit the nail on the head. My Sweet laying hens have provided just enough eggs for me to make a sponge cake with lemon curd and raw blackberry cream, thanks to my local raw dairy farm. I wish thinking about it was enough satiation to get through the next few days, but it is not, Thank you, think you, thank you. Nice to know someone else makes lemon curd the "lazy" way besides me. My amounts are slightly different and I beat the eggs first and then strain them into the pan with the other ingredients before cooking but same method for cooking the curd. Also works for all the other flavors of fruit curd. Fantastic! I will be doing this tonight! Thanks for a great shortcut to homemade lemon curd! You make it sound so easy! I'll have to try this.